Halva refers to many types of dense, sweet confections, served across the Middle East, Central Asia, South Asia, the Balkans, and the Jewish world. 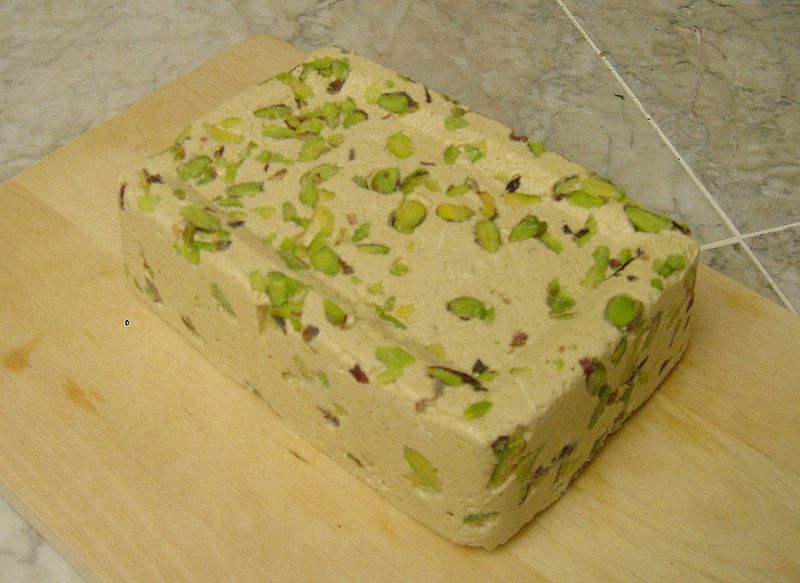 Left: Balkan style tahini-based halva with pistachios. Flour based: This type of halva is slightly gelatinous and made from grain flour, typically semolina. The primary ingredients are oil, flour, and sugar. Nut-butter based: This type of halva is crumbly and usually made from Tahini (sesame paste) or other nut butters, such as sunflower seed butter. 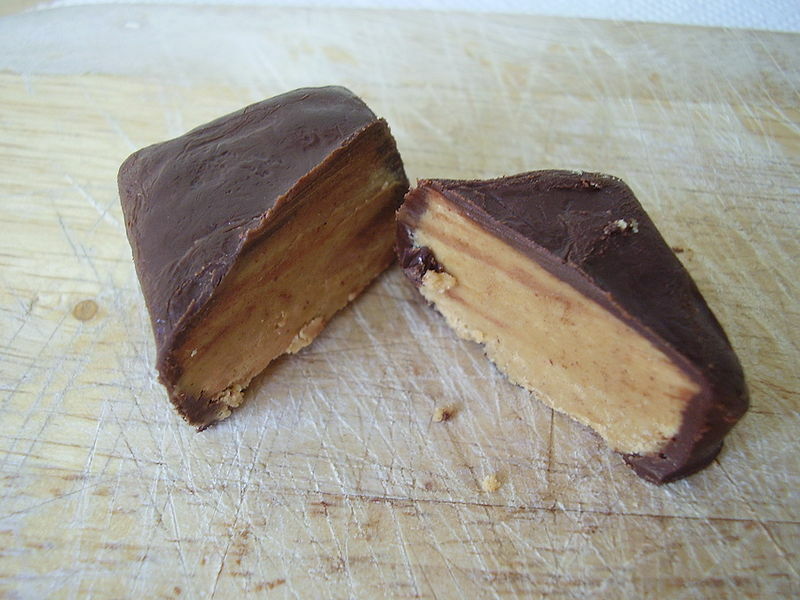 The primary ingredients are nut-butter and sugar. Halva may also be based on numerous other ingredients, including sunflower seeds, various nuts, beans, lentils, and vegetables such as carrots, pumpkins, yams, and squashes. Most types of halva are relatively dense confections that are sweetened with sugar or honey. Their textures, however, vary. For example, semolina-based halva is gelatinous and translucent, while sesame-based halva is drier and more crumbly. Flour based halva is made by frying the flour such as semolina in oil into a roux and cooking it with a sugary syrup. This is popular in Iran, Turkey, Somalia, India, and Afghanistan. Nut butter based halva is made by grinding oily seeds, such as sesame, to a paste and then mixing with hot sugar syrup cooked to hard-crack stage. This type is popular in the eastern Mediterranean and Balkan regions, in countries such as Bosnia and Herzegovina, Croatia, Romania, Serbia, Montenegro, Bulgaria, Russia, Greece and Cyprus, Egypt, Iraq, Israel, Iran, Lebanon, Macedonia, Albania, Syria, Central Asia, Southern India, Caucasus region and Turkey. It is also popular in Algeria and on the central Mediterranean islands of Malta. Sesame halva is popular in the Balkans, Middle East, and other areas surrounding the Mediterranean Sea. The primary ingredients in this confection are sesame seeds or paste (tahini), and sugar, glucose or honey. Soapwort, egg white, or marshmallow root are added in some recipes, to stabilize the oils in the mixture or create a distinctive texture for the resulting confection. Other ingredients and flavourings such as pistachio nuts, cocoa powder, orange juice, vanilla, or chocolate are often added to the basic tahini and sugar base. Sunflower halva, popular in countries from Eastern Europe, such as Belarus, Romania, Moldova, Russia and Ukraine, is made of sunflower seeds instead of sesame. Left: A Russian halva confection.